Devastated by an earthquake on Saturday 25th April 2015, the day prior to the commencement of the Qoros World Championships in Suzhou, more than 8,000 people died, with over 21,000 being reported injured. Rebuilding has very much been the order of proceedings in the past year. It is a situation that will continue in the foreseeable future for the country famous for being in the foothills of the Himalayas and from where expeditions to climb Mount Everest commence. 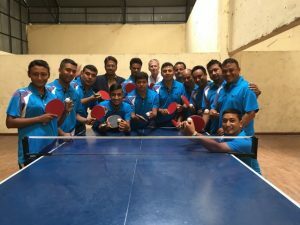 Notably Nepal was the focal point for World Table Tennis Day earlier this year, whilst most recently an Olympic Solidarity supported Developing a National Sports Structure Course commenced. Under the direction of Switzerland’s Georg Silberschmidt, the first part of the two part initiative, which started on Wednesday 20th July, concluded on Sunday 31st July. The second part will be held later this year from Thursday 20th October to Monday 19th December under the direction of Pakistan’s Arif Khan. Proceedings commenced with Georg Silberschmidt leading an ITTF Level Two Course staged from Thursday 21st July to Wednesday 27th July. Venue for the course was the National Sports School in Lalitpur, the third biggest city in the country after Kathmandu and Pokhara. Overall 14 students attended, one being female. “All were motivated and worked hard during the course“, explained Georg Silberschmidt was delighted with the response, having being somewhat concerned with the amount of time available to prepare. “Notably, on day five of the course, there was a nationwide strike; it made it impossible to run the classes on this day“, added Georg Silberschmidt; however, there was a benefit from the pause. “The proved a great opportunity for all coaches to focus on preparing for the exams on day six“, continued Georg Silberschmidt. Most certainly it would appear the time was well spent; seven of the students passed the course with three gaining sufficiently high marks to advance to sit the ITTF Level Three Course. “The course was followed by some training sessions with National Team players and Rajendra Kipali, the Nepal head coach present“, concluded Georg Silberschmidt. “He is a very passionate about table tennis and was delighted to see the players and coaches in action. A successful course, another step forward for Nepal.